"The delicate design of this Armitron Women's Collection Crystal Accent Watch and Bracelet Set will add a feminine touch to your crisp semi-formal and formal ensembles. 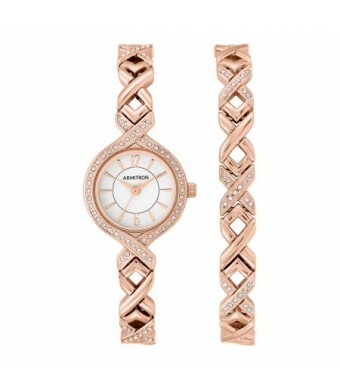 The rose gold-tone bracelet with sparkling Swarovski crystal accents is matched with an round case bezel. 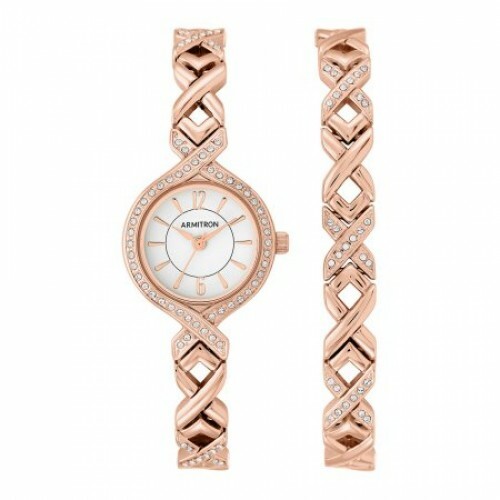 A rose gold-tone link bracelet secures the watch to your wrist with a clasp. The glossy white dial features rose gold UP slightly tapered hour markers and matching rose gold leaf shaped watch hands. "